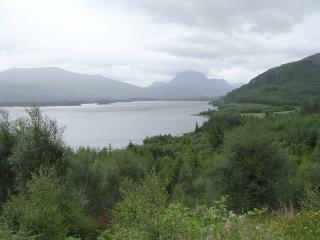 A large loch of Wester Ross in Highland Council Area, Loch Maree is the fourth-largest freshwater loch in Scotland. It extends for 12 miles (20 km) in a northwesterly direction from Kinlochewe to a point 2 miles (3 km) south of Poolewe, where a stream empties from the loch into the sea at Loch Ewe. Although quite narrow, generally a half-mile (1 km) in width, it broadens out to the northwest (to 2 miles / 3 km) and it is here that the majority of its more than 60 islands and islets are located. The loch has a maximum depth of 112m (367 feet). The loch is said to have been named after St. Maelrubha (642 - 722) who established a hermitage on Isle Maree. Loch Maree forms a Special Area of Conservation and its islands are designated as the Loch Maree Islands National Nature Reserve (NNR), combined in 2014 to form the Beinn Eighe and Loch Maree Islands NNR.